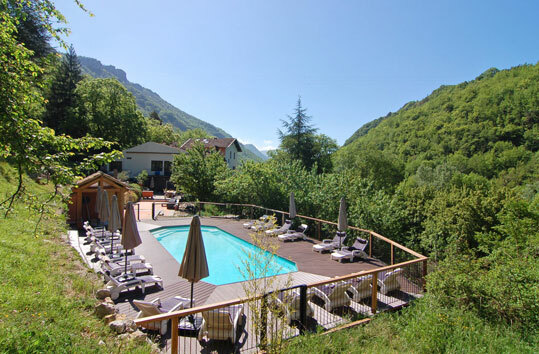 Le Foulon has had many successful tai chi and yoga retreats held here, with our guests raving about the space, light and most of all the atmosphere of peace and tranquility. As you can see from the photo above, our garden is as stunning as it is relaxing, with a large flat field ideal for your training exercises. And for indoor training we can move the tables aside in the 11x.55 metre (36x18ft) dining room for a beautiful space bathed in natural light with an uninterrupted vista of mountains and forest. If you run a Tai Chi School, you are a Yoga teacher or are interested in finding the ideal center for a detox course, then please contact us. 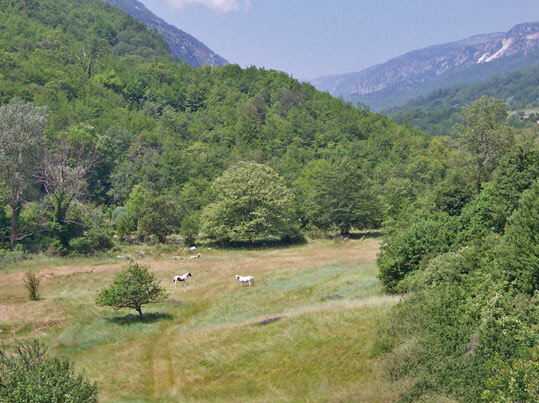 The location of le foulon is not only very practical for getting here from anywhere in the world, it's also an unrivalled location for nature and tranquility. We can create a free web page helping you to sell your idea to your students and clients alike, help with the planning and generally bring our experience to smooth the way to a successful retreat. We can tailor a price to your requirements and even provide a good value catered service for your group, taking into account any dietary needs. In August it's necessary to rent all of Le Foulon by the week from Saturday to Saturday (please consult our weekly lets page for pricing), but in the spring and the autumn when the sun still shines and the crowds have parted, we can offer shorter stays to fit with your needs. Even in the Winter we have tons of very sunny blue sky days, and there's nothing like a roaring fire to create a homely relaxed atmosphere. Please contact us for pricing. "I came here for a yoga retreat and it was wonderful. Even though there were 20 of us, it never felt cramped and like we all had our own space. The grounds were stunning, and the food- oh the food! The owners were very kind and accommodating. It was absolutely a lovely place to stay in the mountains.."
The south-west facing indoor training room is bathed in natural light with views across forested mountainside. Ideal for up to 18 students and the teacher, as seen here. You can choose to self-cater and bring your own chef, or take advantage of our catering service. Our kitchen is a joy to use and fully equipped for group catering with a very large walk-in fridge, industrial oven and hob, professional coffee machine, ice machine and every other machine and implement required to make cooking for a group easier. We even offer an optional shopping service, delivering restaurant quality food and produce at supermarket prices, ready and waiting for you on arrival. Not only does this help you budget for your stay here, but it gets you up and running from the moment you walk through the door. Alternatively there are two supermarkets and a specialist whole food organic market on the way up from Nice Cote d'Azur International airport (only 45 minutes drive). 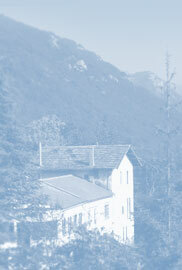 We can provide directions and opening hours. If you choose to use our catering service then we have regularly provided vegetarian and vegan menus, 3 times a day for a week, or the above with some healthy meat and fish options for those that want them. Tell us your requirements and we'll provide a quote. If you'd like part catering and part self-catering then that's no problem either, we try to be as flexible as we can to your needs. 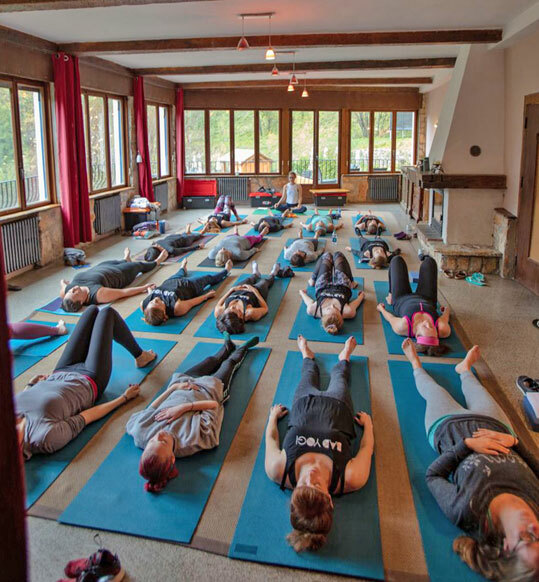 With a solid floor, natural light and warm ambience, it's the ideal training center for your yoga group. 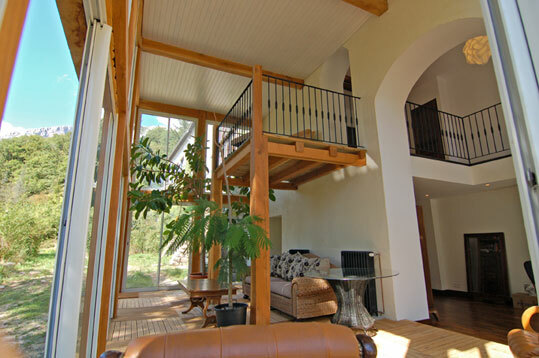 Our double height conservatory makes a great meditation room and has an adjoining English-language library. 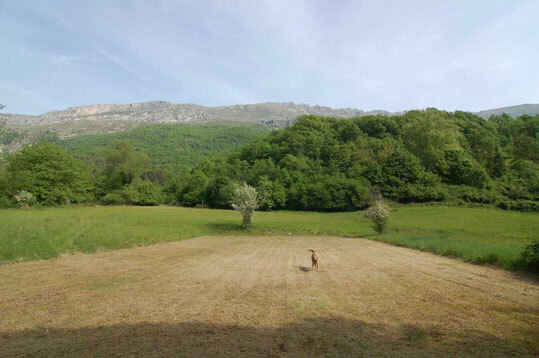 This is the view from the training room across our garden. The sun sets in the fold of the valley through the summer months. The horses are an occasional addition. Move the sunbeds to one side and you have a wonderful and practical outdoor space to practice yoga. 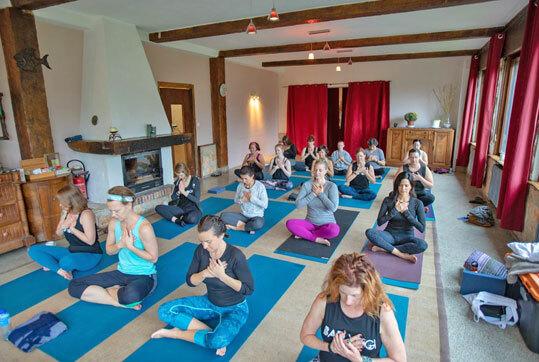 "Le Foulon is magical - I can't think of a place better suited for a yoga course - with plenty of space & facilities to keep the harmony of a large group."